H. Edward Lowe is considered the father of the cat litter industry. In January 1947, Lowe had a thriving building supply business in Cassopolis, Michigan. One of Lowe's neighbors asked for his assistance in "finding something absorbent" to put in her cat's box other than the sand ashes that she had been using. His answer was dried ground clay. Nearly 50 years later, the cat litter industry has grown into a multi-million dollar business. Sales for 1994 were estimated at $767 million, and are expected to increase significandy throughout the decade. Until Lowe's invention of "kitty litter," a product that enabled cat owners to have an indoor cat box, most owners had little choice but to let their house cats out. The advent of cat litter brought with it the possibility of a more domesticated cat that no longer needed to be let out. In 1995, approximately 34.1 million Americans, or nearly one-third of all households, are cat owners. Cat box fillers can be categorized into two types: conventional and clumping. Although the size of the granules varies, conventional cat box filler can be described as gravel-like in texture. Most brands claim to be dust-free or dust-reduced and to have a deodorizing agent. With conventional litter, the contents of the cat box must be discarded every time the box is cleaned in order to ensure that the cat has a thoroughly fresh supply of litter. Clumping litter was introduced in 1989 and accounts for approximately 30% of today's cat box filler market. The smaller granule litter sticks together when it comes in contact with liquid, hence the term "clumping." When clumping litter is used, the cat owner can remove the clumps, then add more litter to the box, eliminating the need to refill it with every cleaning. The major drawback of clumping litter appears to be its tendency to "track," that is for the finer granules to stick to the cat's paws when it leaves the box. Cat box fillers made from absorbent clay account for approximately 95% of all cat litter. Clay, a naturally-occurring, nonmetallic substance, is composed of a combination of aluminum silicates and minerals. Light-colored clays are more popular than the darker clays because the latter tends to become muddy when wet and cannot absorb additional moisture. Although most commercial cat box fillers use an absorbent clay as their base, any-thing that can absorb moisture theoretically can be used as cat litter. Recycled waste products from the lumber industry are used to make alternative cat litter. A blend of cedar chips and hardwood, for example, is lighter than clay-based litters, and its cedar scent absorbs litter box odors. Another type is made from the waste products of aspen lumber. In this manufacturing process, the sawdust and bark are finely ground, then heated to 1200°F (649°C) in a kiln-type vat. This causes the resin or tree sap to bind the wood together as the material is extruded through a screen to form quarter-inch pellets. The pellets are then passed through a cooling tank on a covered conveyor before they are packaged. While cat litter can be made from wood, paper, grain, corncobs, citrus, and grass, 95% of all cat litter is made from clay. The natural absorbency of paper makes it a viable alternative to traditional cat box fillers. To produce "paper" litter, post-consumer newspaper is re-pulped, de-inked, and screened. During the re-pulping process, long fibers are processed back into paper, but short fibers are considered waste. The short fibers are de-watered, pelletized, dried, combined with an odor-control agent, and packaged as cat litter. Like those made from wood, paper litter is also lightweight, about 40% less than clay-based litters. This paper-based litter is also flushable in small quantities. The byproducts of hard grains are also used as alternative cat litter. The manufacturer mills hard grains, similar to those used to make pasta, to a consistency required for mixing and pelletizing. Fragrance, small pieces of corncob, and sometimes catnip are added. An advantage to grain products is that the enzymes in the mixture naturally neutralize the cat's waste odors. Odor-control, tracking, and dust are three areas of concern for cat litter manufacturers. Many companies experiment with different ingredients and test out the litter on their own cats before selling it to pet owners. spongy center are ground, heated, and processed into pellets, which are reground and screened. Compared to the same volume of clay product, the material weighs about half as much and is five times as absorbent. Other advantages are that the litter clumps and is flushable. Recycled waste from the citrus fruit industry makes fresh-smelling cat box fillers. The manufacturer takes peels of de-juiced citrus fruits, presses them, and dries them in natural gas-fired kilns. A screening process removes the dust and fine pieces from the final product. Citrus cat litter is highly absorbent, flushable, and biodegradable. In addition, the residual citric acid in the dried peel naturally neutralizes waste odors. Finally, cat litter has been made from northern red wheat straw grasses. Bales of straw are ground and chopped into tiny pieces before they are pelletized. The pellets are vacuumed twice to remove dust and then packaged. The resulting product is biodegradable. Cat litter made from wood, paper, grain, corncobs, citrus, and grass account for only 5% of today's market. The rest—about 95% of all cat litter—is clay based. Cat box fillers contain few ingredients, and the entire production process is performed by the manufacturers who mine, dry, and size their own clay. 1 Various kinds of clay are found through-out the United States, especially in Alabama, southern California, southern Illinois, eastern Kansas, Nevada, Oregon, southeastern Texas, and Wyoming. Clay is found approximately 30-40 feet (9-12 m) below the surface, and earth movers scoop it from open pits. The raw clay is then transported to the plant. 2 The clay is loaded onto conveyor belts and spilled into giant crushers. 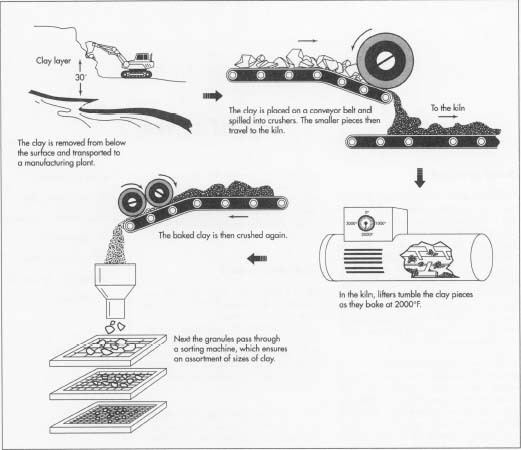 The crushers break the clay into smaller pieces, then deposit them onto another conveyor belt, which feeds the clay into a kiln. 3 The kiln resembles a horizontal chimney or sewer pipe, 100 feet (30 m) or more in length. Inside the kiln, where temperatures can reach 2000°F (1093°C), lifters tumble the clay as it bakes. The clay continues its baking process until it has traveled the entire length of the kiln. 4 As the clay emerges from the kiln, it is fed into a second crusher. Here, rollers crumble the clay to its final consistency. 5 Next, the granules pass through an enclosed machine that contains a series of screens stacked one on top of another. Here, the various sizes of granules are sorted. Because litter is less absorbent when granules are the same size, the sorting process ensures that an assortment of sizes are represented. 6 Clumping litter, which are ground to a smaller size than conventional litter, are frequently blended with sodium bentonite, a naturally swelling clay known for its absorbent qualities. 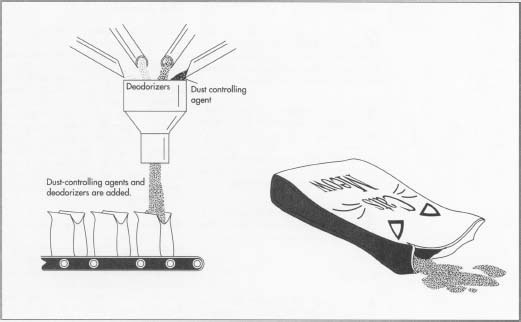 A dust-controlling agent is then added to the ground clay to prevent the dust, created when particles rub against one another, from becoming airborne. Most cat litter manufacturers also add deodorizers to prevent odors. Odor-control, tracking, and dust are three areas of concern in the manufacture of cat box fillers. Many companies keep their own colonies of cats to test their products' effectiveness in these three areas. Feedback from cat owners is also important to manufacturers, who usually provide toll-free telephone numbers on the products' packaging. Inventors like Theodore Kiebke are trying new materials to develop a better cat box filler. As an alternative to the traditional clay cat litter, he invented "wheat litter," which clumps, does not contain silica dust, and does not track. He experimented with different flours and corn starches before he hit upon durum wheat, which is used to make pasta. He mixed it with regular clay litter, and, after a few refinements, wheat cat litter was created. The product is billed as non-toxic, 100% biodegradable, almost dust free (and totally free of silica dust), scoopable, odorless, and has minimal tracking problems. Another new product in the cat box filler industry is called "indicating cat litter." This product changes color to indicate the pH level (a measure of acidity or alkalinity) of a cat's urine. Knowing the cat's pH level is important in managing feline lower-urinary-tract disease (FLUTD), a condition that, in its most serious form, can kill domestic cats. Despite obvious benefits, indicating cat litter has its disadvantages as well. For instance, the litter works best immediately after the cat has used its box; if the litter box is not checked for several hours, the urine clump dries out and the color disappears. Sprinkling the dried clump with distilled water, however, will bring back the color. "Cracking the Cat Litter Code." Catnip: A Newsletter for Caring Cat Owners. Tufts University School of Veterinary Medicine. May 1993, pp. 4-6. "In or Out?" Catnip: A Newsletter for Caring Cat Owners. Tufts University School of Veterinary Medicine. January 1995, p. 1. "Wheat Cat Litter." Catnip: A Newsletter for Caring Cat Owners. Tufts University School of Veterinary Medicine. February 1995, p. 7. "The Cat Box Filler Industry." Golden Cat Corporation News Release. February 23, 1995, pp. 1-5. Shojaim, Amy D. "How Cat Litter Is Made." Cat Fancy Magazine, October 1994, pp. 12-14, 16, 18-19.